Weeds are part of the ecosystem in an organic farm. We should not aim to eradicate them. Weeds can attract insects, many of which are beneficial. 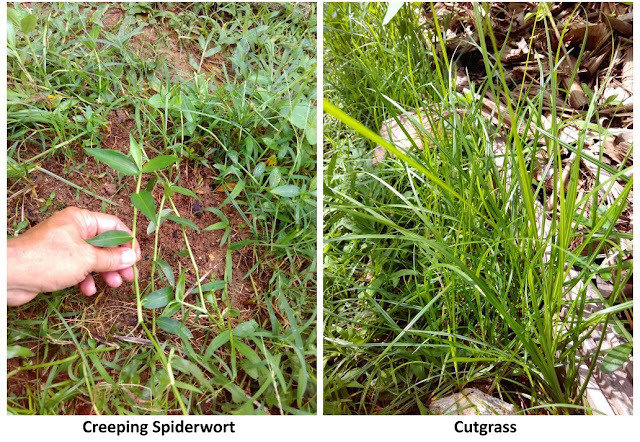 Weeds can enrich the soil through the interaction of their roots and soil microbes. My approach to weeds is that I trim and remove some of the weeds when they become overwhelming, competing for sunlight and space with my crops. I do not think that weeds can compete with crops for nutrients in the soil because if the soil is reasonably healthy, there would be more than enough nutrients for both crops and weeds. It is more the question of whether the plants are able to absorb the nutrients available in the soil. If the soil is poor in organic matter and microbes, it would be difficult for our crops to absorb the nutrients available in the soil. Simply said, organic matter and microbes in the soil help transport nutrients to the roots of the plants. Weeds removed is a valuable resource. It is a good material for mulching. Many would dry them before using them as mulch. I often use them fresh. If the weeds regrow or if their seeds germinate, I am not too bothered. If one spends a lot of effort killing off the weeds and their seeds before using them as mulch, he/she is wasting time, because in an organic farm, there’s bound to be weeds thriving. We also should not be aiming to eradicate all the weeds. I believe I have made a conclusive observation in these few months of growing brinjal. I use freshly cut weeds to mulch around my brinjal plants and the results are rewarding. The plants bear many flowers and fruits. I can afford to apply less fertilizers too. I think as the fresh mulch are breaking down, the nutrients and organic matter that go into the soil proliferate the microbial activities in the soil around the brinjal plants, benefiting them. The fresh mulch consists of about 70% of Cutgrass and 30% of other weeds. I consciously avoid using Creeping Spiderwort in the mulch as it is too aggressive and invasive. When we collect weeds for mulching, it will therefore be convenient to carry two buckets, one for Creeping Spiderwort (to be killed by sun-drying thoroughly), and the other for the useful weeds. Everything created by God on this planet is useful, some of the uses we know about and some we donot know about. So nothing should be eradicated but its uses should be researched about.